Have you ever heard that too much of a good thing is not a good thing? It’s true! Laundry detergent is great- it gets our clothes clean and keeps fabrics smelling fresh. But have you ever wondered if you’re using too much soap in your washing machine? You may be surprised to find out how common it is to overdo it with too much detergent in the washer. Detergent needs to be integrated into the water properly in order to rinse completely out when the wash cycle is finished. Let’s take a look at common signs that indicate you may have a heavy hand with the laundry soap. Just like today’s cars, many modern washing machines have error codes to alert you when there is a problem. A common error code to see is SUD or ND – although error codes vary by brand and model, these codes show the machine has detected excessive suds. If you’re using too much soap in your washing machine, the machine may not be able to handle all the foam generated from the soap. This extra-sudsy bubble bath can actually back up into hoses it doesn’t belong in causing damage to your machine. Cue the washer repairman. Too much detergent in the washer might strengthen the aroma of your clothes, but it can make your washer smell awful! Many detergents have ingredients in them that actually get gooey under the wash tub where you can’t see. Over time, this sticky residue starts to collect dirt while mold and bacteria growth begins. As all of that nasty stuff grows, you notice your washer smells bad… I don’t know about you, but I’d rather leave the science experiment in biology class. We recommend cleaning your washer with Affresh tabs once a month. Get Affresh washing machine cleaner on Amazon. You have kids, pets, a handy husband- all leave clothes incredibly dirty. So you use more detergent to get all that grime out. When you repeat this excessive detergent usage, eventually your machine rebels and you may begin noticing spots and marks left on clothes. These dirty smudges and spots are usually a result of mold growth in the washer – another strong indication that you’re using too much soap in your washing machine. The excess soap scum left from using too much detergent is a magnet for dirt and bacteria growth. 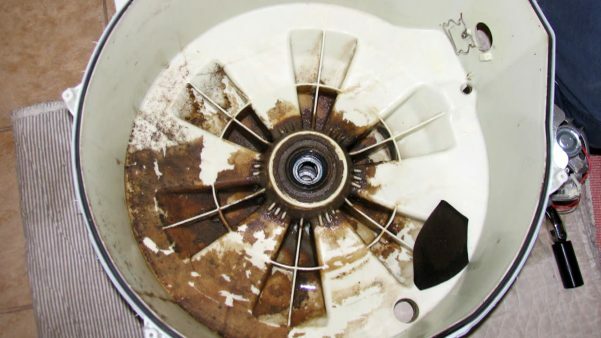 When this starts to happen, you’ll need the internal parts of your washer cleaned and a possible door boot replacement. Using too much soap in your washing machine is now behind you and your future laundry holds a new promise – so how much soap should you use? Generally speaking, one tablespoon is enough to thoroughly wash a regular load of clothes. If you have a front loader or other HE machine, reducing your detergent is a must! Use an HE-friendly detergent and use it sparingly – it will clean everything beautifully without harming your appliance.